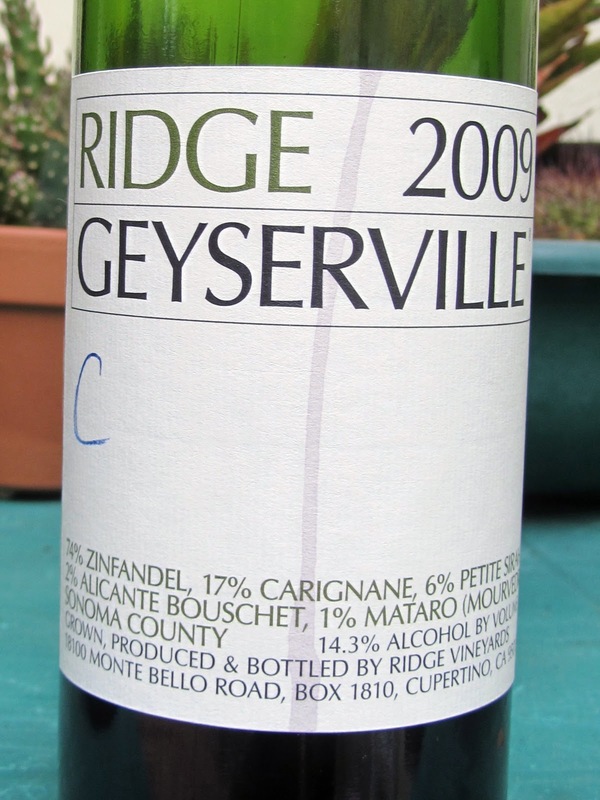 After reading Robert Parker's ratings for the 2009 Ridge wines, I had a hankering to put this to the test. Our house was a mess due to our refrigerator breaking down, coolers of food were strewn accross the family room, and everything usually found atop the frig, was now on the dining room table; what better time to have a blind tasting. That I would even consider a blind tasting in this situation attests to my fanaticism and my wife's ability to entertain on a moments notice and her likeness to an angel. I sent a text to Jose, good friend and known Zinfindel lover, about my crazy idea. He quickly responded; he and Lili were in. I headed to K&L and Sue went to work on the house. Arriving, I found the shelves empty of the Ridge wines I was looking for. At this point it occurred to me that I should have checked their availability via the web site before I drove the 25 minutes to the store. 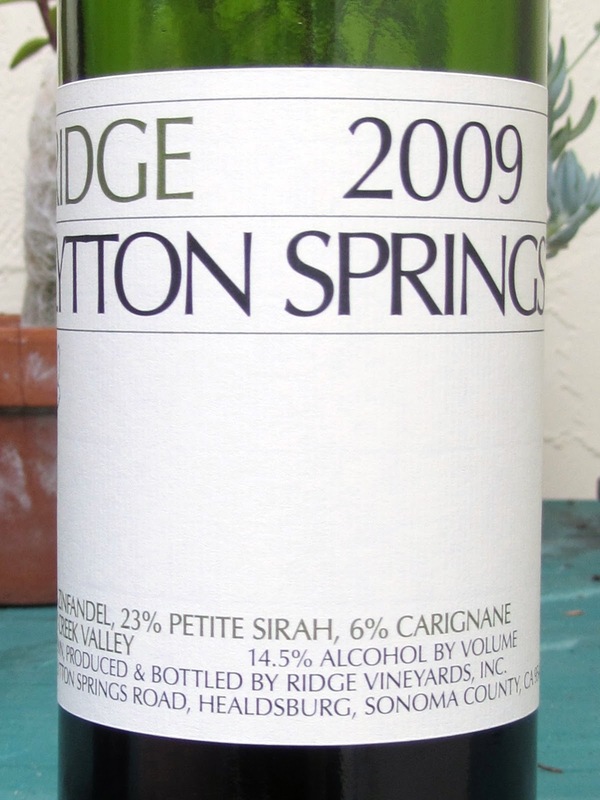 Thankfully, after some searching and help from the staff, I found what I was looking for: 2009 "Lytton Springs", 2009 "Geyserville", and even the 2009 "East Bench", which the web site said they were out of. I didn't want to just taste Ridge wines, and Sue thought 5 was too much, so I decided to only taste the top two. 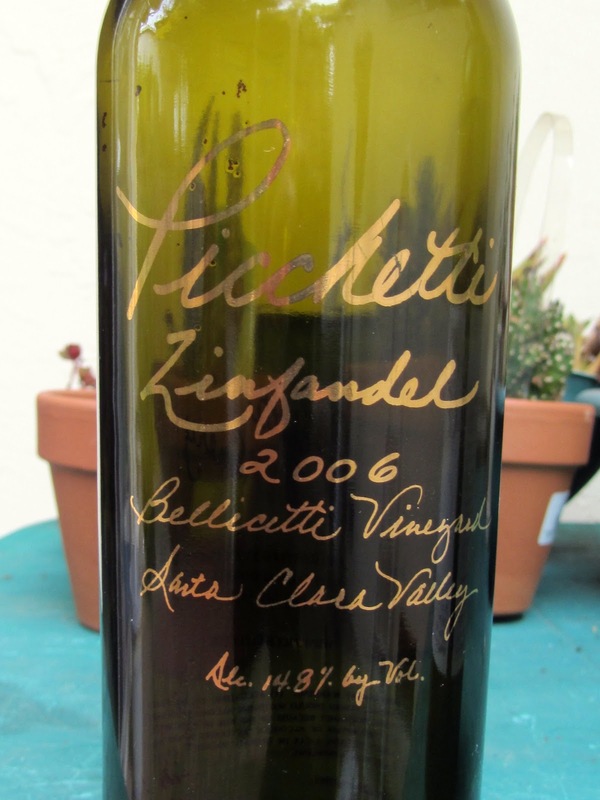 Additionally, I threw in a Zin from Storrs I had lying around and a 2006 Picchetti Bellicitti, a group favorite and a wine I know Lili loves. Jose brought a bottle, even though I told him not to. Instead of putting it into the mix, we decided to try it afterwards. We all dug in, trying the wines and comparing notes. It was a tad cool and a little breezy, which may have influenced the wine tastes and smells. Everyone had a hard time getting a good nose off the wines. Almost everyone but Lili was convinced the first wine was actually a Pinot, which drove me nuts wondering how I had messed up the bottles. It was a lot lighter than the other Zins, and had a vegital Pinot smell. At one point Jose was willing to bet $100 on it, but I couldn't take the bet for two reasons. First, I never like to bet such huge amounts. Second, I thought I knew more than he did, since I thought the wine was a Ridge from the silver neck I had noticed when I poured it. 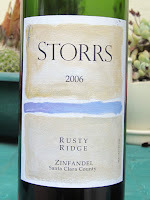 As it turns out, it was the Storr's Zin, or so the bottle said. Jose was still convinced it was a mislabeled bottle. 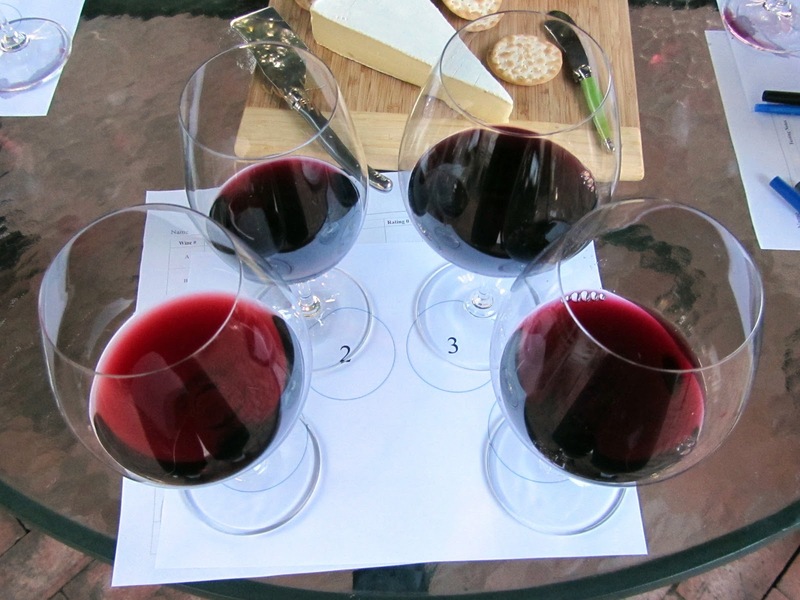 After we were finished rating the 4 planned wines, we poured a glass of what Jose brought and rated it. 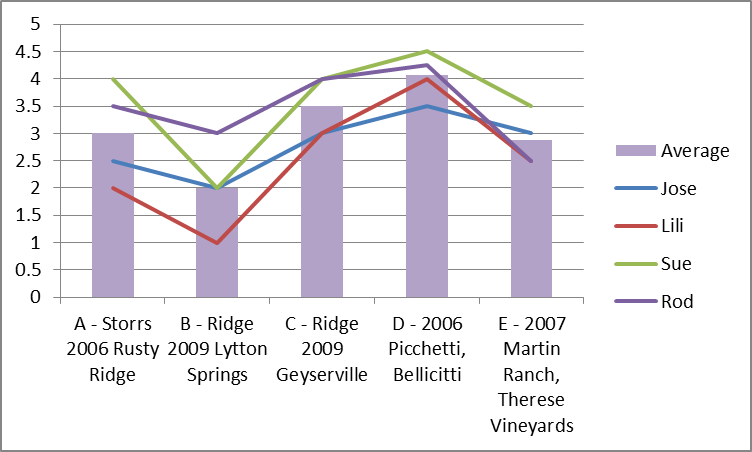 D - 2006 Picchetti, Bellicitti came in first with an average rating of 4.0625. 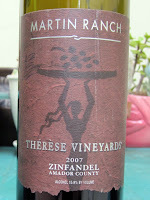 Purchased at club case discount price at the winery for $25; retails for approximately $37, though I've never paid this. I originally purchased 3 cases when I found out it was in short supply. After this one, I'm down to 3 left. 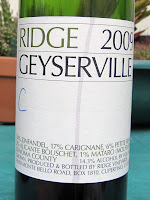 C - Ridge 2009 Geyserville came in second with an average rating of 3.5. Purchased from K&L for $29.99. It was given 94 points from Robert Parker. Parker said it's anticipated maturity is 2012-2029, so it'll probably get even better. 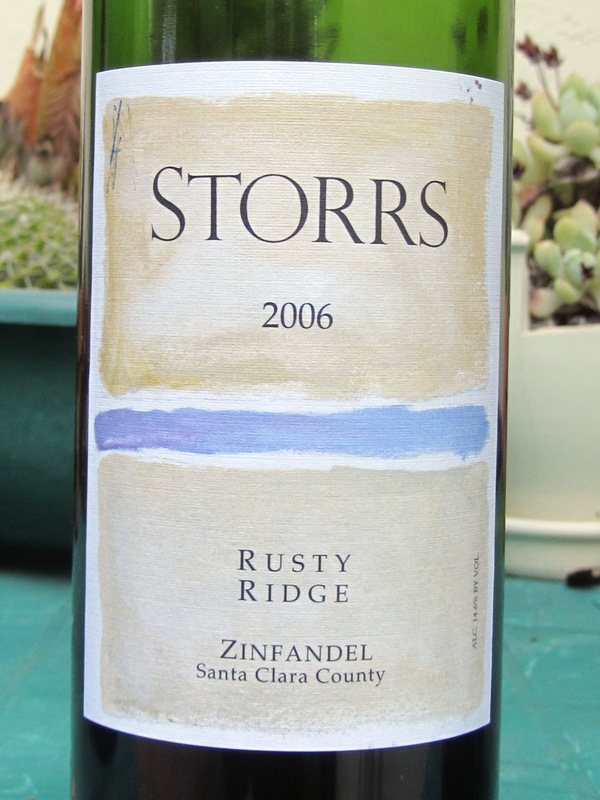 A - Storrs 2006 Rusty Ridge came in third with an average rating of 3. Purchased from the winery for $30; I believe we got 10% to 15% off this price, but I can't remember. This was the wine all of us, but Lili, thought was a Pinot. 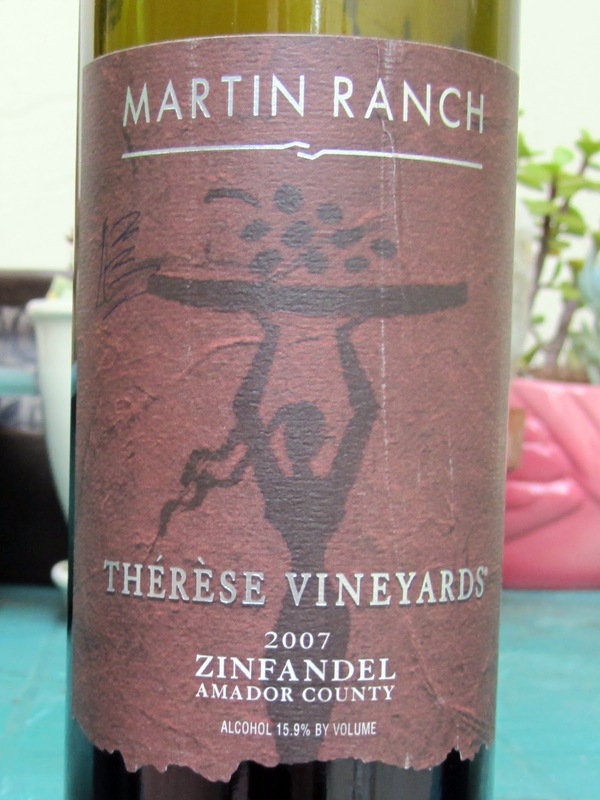 E - 2007 Martin Ranch, Therese Vineyards came in fourth with an average rating of 2.875. Jose brought this because it was from Amador county, and he was sure I wouldn't have any from that region. He likes wine from this region. He paid $25.99 at Whole Foods. It was too jammy and sweet for my taste. 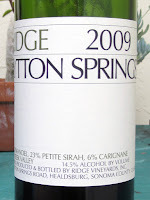 B - Ridge 2009 Lytton Springs came in dead last with an average rating of 2. Purchased from K&L for $31.99. It was given 95 points from Robert Parker. In fairness, Parker said it's anticipated maturity is 2013-2029, so it'll hopefully get better. 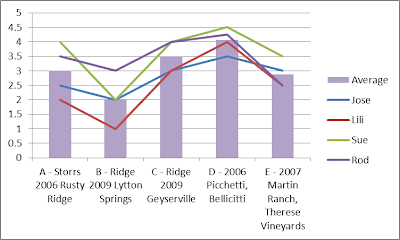 It's pretty shocking that Lytton Springs came in last. 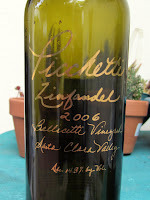 I was glad to see the Picchetti held up. We headed inside with our favorite glass to enjoy what Sue had whipped up for us.